Below is an example chart from the 20-chart version. The 10-chart version is obviously more zoomed out, and the 30-chart version more zoomed in. You'll find more screenshots on the website. To give some background I already have and use the Interstellarum atlas for when I’m at the eyepiece, and I have the SkyAtlas 2000.0 laying around, and also the Cambridge Atlas Of Herschel Objects. But sometimes I just want something smaller, but not so small that you can't see anything on it. Something that can be laying around on my desk, and be used for checking out a constellation for deepsky objects or for planning a night of observing. An atlas that shows you details, but where each chart covers quite of a bit of sky so that it doesn’t feel like you’re looking through a keyhole. Apart from that I’ve also always felt the need for one simple small-scale set of maps that I can grab first thing when I'm setting up at the observation site, or to show someone the constellations, or for panning the milkyway. I find a planisphere to be way too small for that. I used to have a printed version of Taki’s 6.5 mag atlas, and also the Mag-7 Star Atlas, and I've checked out the Beginner's Star Atlas as well. But I find these to be a little too small-scale still. And at the desk, they just seem a bit limited to me. Then there's the Pocket Sky Atlas and the like, but now suddenly you're looking at a very narrow part of the sky, and given the small physical size you have to flip through lots of pages. A larger atlas like Interstellarum is great, but doesn’t give me the kind of overview I’m sometimes looking for. I also find most of these atlases to have way too large margins, it feels like they're not using half of the page. I’ve been wanting something that is just a few sheets of paper thick, that prints all the way to the margins, and still shows a decent amount of deepsky objects. The closest thing I found to this was SkyAtlas 2000.0 but it’s just too bulky for me. And so I Finally I decided to dig in and make them myself using Cartes du Ciel and some PDF software. 20 charts for the whole sky (both hemispheres) turned out to be just the right scale for me. By utilizing double-page spreads I feel I was able to make two printed papers appear as one big chart, and especially when printed completely without margins, which you can do with these. This means I get A3 sized charts, but printable on regular A4 paper, and folded down to A4. And don't worry, I've got Letter sized versions as well. When I was half-way done I decided to also make a 10-chart version and a 30-chart version. 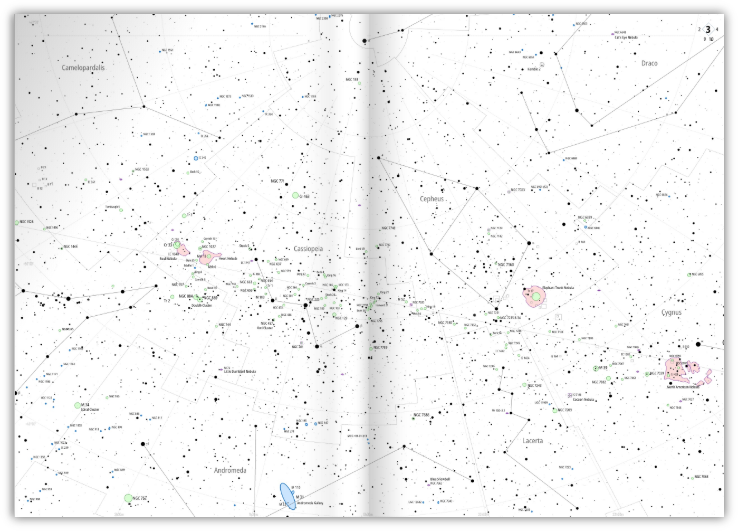 The 10-chart version turned out to be just the high-level overview atlas I had been looking for, great for learning the constellations and to see where the brightest deepsky objects are. One thing that might be said of these atlases is that the print is quite small, so it might be hard for some to use, and maybe especially so in the dark at the eyepiece. But at least the 20-chart and 30-chart versions are not primarily intended to be used there, but at the desk or before an observation session. I hope you like them, and let me know if you find any errors or have any questions. Edited by Olle Eriksson, 23 January 2019 - 04:43 AM. Olle, thanks for all the work you've put in on these charts! I'm moving this thread to Astro-art-books-websites-other-media forum, for a better fit of the charts. A link will be left so members in GO&A can continue following your thread. Interesting! I'll be checking them out. There's a lot of objects missing identifiers, chiefly galaxies and planetary nebulae. Also, some regions get incredibly crowded and a way to help this would be to skip the "NGC" letters in front of the NGC numbers. That alone would cut down a lot on the clutter. I also don't like colored star atlasses, when used outside. They look nice in daylight, but the red objects can be very hard to see, when using a red flashlight. A B/W version would be nice (or you can just print it in B/W I guess). This is just a personal bias, I suppose. I also question whether the 30-page atlas really shows stars to mag 10, as the old version of Uranometria 2000.0 only went to 9.5, but shows VASTLY more stars. In the 30-page atlas, the entire Kemble's Cascade is missing, despite consisting mostly of stars mag 8-8.5... The general limiting magnitude of the 30-page atlas seems to be around ~8 (and incomplete at that) with a sprinkling of fainter stars thrown in here and there. This can make starhopping next to impossible, as fields can be completely unrecognisable at the eyepiece. On the positive side, I really like the layout and style. Now, can you make a very large DSO rich planisphere? Suitable for getting printed at a print shop on large poster stock and laminated? I'm serious... that would be cool. I have been messing around trying to make such a huge DSO rich planisphere for years! Say 60cm (24 inches) diameter printed? Very nice Ollie. Thank you! You're spot on about Pocket Sky Atlas. I love it and I hate it, Love its compactness, but dislike thumbing pages so often on account of the tiny slivers of sky represented on each page. Enter the Jumbo Pocket Sky Atlas. Same great taste, but no longer fits in anyone's pocket. As much as I like the JPSA, I think your approach is better. I'm studying your charts now, but so far I really, really like them. I'm thinking I'll laminate all three versions (10 page, 20 page and 30 page) and have them spiral bound. It seem's you're right! There are nowhere near enough stars to be close to magnitude 10. It appears I had only the Extended Hipparcos catalog installed in CdC when generating these. Installing The Tycho 2 catalog changed things alot. I have removed the limiting magnitude information from the website and added a disclaimer. I will fix the PDF's later. Not sure what to do with this right now. Increasing the limiting magnitude adds many more stars, and changes the look of things, makes it much more crowded. I had taken into consideration what you're suggesting, removing the NGC part of the designations, but in the end I decided not to. I do want to keep the appearence of the charts as they are now, so it's possible that I will let things be the way they are but change the information text. Also it's a bit of a pain to go through all 60 charts (10+20+30) or 120 if you count each A4/Letter as one. And as I said in the text, my primary goal for these atlases was to be used at the desk. Regarding the colors, I've tested them and everything should come out right in the dark under a red LED light. But it is a compromise, because if you print them in black and white, all the gray colors become a little less crisp and sharp on most desktop printers. Also, it turns out that printing colors with the CMYK color spaces out there wasn't as simple as I had thought at first. So while the colors look good on a monitor they do come out a bit different on a printer. In any case I'm not competing with Uranometria or any of the commercial star atlases. My atlases, at least the 10- and 20-chart versions, were made solely because I needed something that I felt was hard to find elsewhere. Edited by Olle Eriksson, 23 January 2019 - 03:50 AM. Thanks for your work and contribution to the community, Olle! Do not despair in the face of difficulties or criticisms. Making good maps or atlases (accurate, useful, fit for certain purposes, visually pleasant, practical and cheap ) is a difficult art that takes a lot of time effort and dedication to master. You have done pretty well so far! Forgetting to include the Tycho 2 catalog was unfortunate. I should have read up more on the subject before generating the charts. The Hipparcos catalog's limiting magnitude is not consistent and is only really complete up to around 8. I'm still considering what I should do next. The problem is all the post-processing work required, my marriage, and the number of hours I've already spent on it. I will run some tests to see the difference. As Astrojensen points out, it would be more accurate with a fixed limiting magnitude for star-hopping purposes. On the other hand I have no aspiration to try to push the limiting magnitude down though, or more correctly increase the star density of these maps. The fine balance between number of stars and number of deepsky objects, in both the star-dense areas and deepsky-dense areas is right where I feel I want it to be. So I guess for the 20- and 30-chart versions, *different* stars would appear and replace existing ones if I include the Tycho 2 catalog and raise the limiting magnitude to compensate for increase in star density to retain the current look-and-feel. I like EverlastingSky's idea of a large detailed planisphere. That's something I've never seen before. I don't want to promise anything though. Ok, so I've looked at the situation now, and I've found a workflow that will allow me to relatively easily to re-generate the charts. On the other hand I found that the difference between having the Tycho 2 catalog and not is not extremely obvious, and I would expect in most situations pretty negligible. For the Medium-scale edition on 20 charts and the originally stated limiting magnitude of 9, at least when comparing charts around the northern pole, I had to look very very carefully and even "blink" the charts to find a star that appeared with Tycho 2 and disappeared without it. Below are such two samples. Hard to tell the difference right? Probably for the 20-chart edition the change to including Tycho 2 data will be hard to notice, partly because of the lower scale. Looking around Kemble's Cascade (also in the northern sky) and increasing the scale to what's used in the Large-scale 30-chart edition, it became a little bit more obvious though. 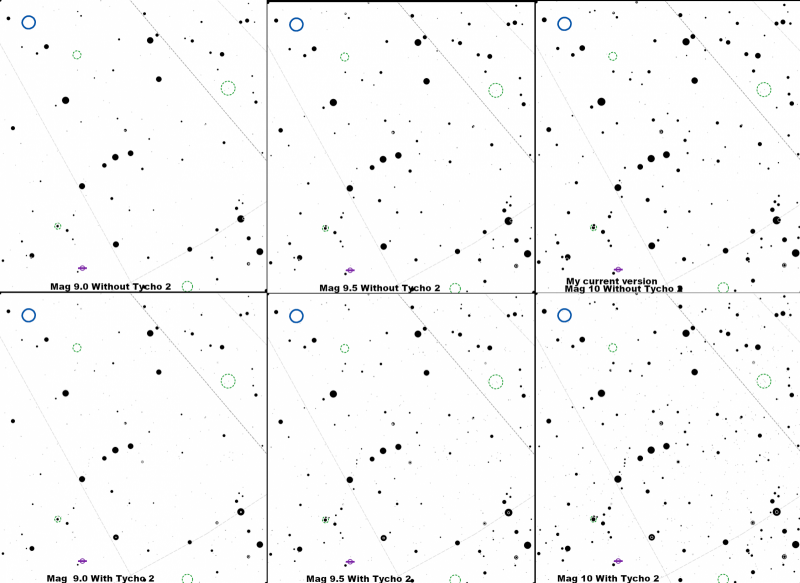 And, going to magnitude 10 on the 30-chart edition, there is a clear increase in the number of "faint" stars. But it doesn't change the look-and-feel as much as I thought it would, and I suspect it's because I'm using such small star symbols, which is intentional to sort of keep the stars out of the way a bit. Perhaps, for the 30-chart edition the usefulness ends at around magnitude 9.5. I wonder how useful those small dots are going to be. We'll see if I set the limit at 9.5 or 10. Any opinions? Agreeably it's a bit hard to compare using only screenshots, but I think it says something at least. I will work on updates to the 20- and 30-chart versions and post here as soon as they are done. So if you have any opinions on colors, inside overlap etc now is the time to tell me. The more stars the better - in my opinion - but I know others may disagree. Too many stars could be confusing? Mag 10 with Tycho 2, why not? I like the charts you have prepared -- thanks! The set I will probably use the most is the 10-page version to allow me a big-picture view of the sky before star-hopping my way across a (another) very detailed chart to find some tiny object of my interest (I prefer several other detailed atlases, depending on the object, so I personally am not worried about the level of detail in your 30-page version). But for a big-picture view, the Pocket Sky Atlas was not quite wide enough, and the Sky Atlas 2000 was too large in format for my particular uses. I have placed the sheets of your 10-page atlas in clear plastic sheet protectors within a simple binder folder as a quick/easy "binding" solution for me. In glanced through the pages, the only "surprise" was the constellation line that connected Cetus with Eridanus because of pi Cetus. Most of the other atlases don't bother with this particular line, which (at least to me) adds a very small degree of confusion/unfamiliarity. And of course, there are various techniques for displaying constellation lines in general, and they do not bother me -- they add interest and variety when depicting the sky. Only this particular line was "different". Anyway, thank you very much for preparing such a useful set of charts. In general I like your approach. One thing I noticed was how sparsely the stars were labeled. Some constellations didn't have a single label on their stars. I'd prefer to see Bayer or other appropriate designations on more of the stars, particularly at the stick figure vertices. Clearly you can't label everything, but more labels would be helpful. I could live without proper names for most stars. 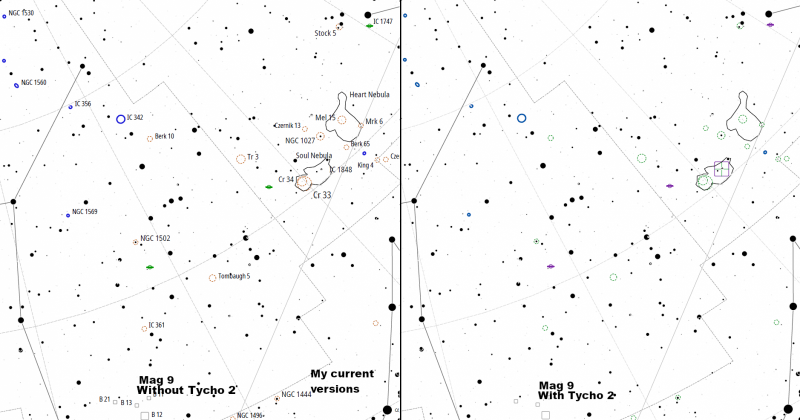 However, it might be helpful to label the dozen or so brightest or more significant stars with their proper names. Omitting the NGC prefix is done in the Pocket Sky Atlas and I think most people would be fine with that. Just note it at the beginning. I played around with the star density but settled for the same limiting magnitudes I had before, except the 30-chart edition which I gave a 9.3 magnitude limit. By redoing them all I also got the grid lines to end up behind the star clusters and galaxies, something which was a problem before. The star density is identical for the 10-chart edition, for the most part negligible for the 20-chart edition, but the 30-chart edition has a few more stars now although I managed to retain the look-and-feel by making the stars slightly slightly smaller. For all intents and purposes I don't think anyone will notice, but at least I know that there is a consistent limiting magnitude. I do believe the faintest stars are still too small to be reliably used in the dark at the eyepiece anyway, these charts are probably better suited for the desk. Regarding the labels and keeping the "NGC" prefix, I looked into it but could never find a way to make Cartes du Ciel omit them (there was some discussion on their mailing list to make it possible but I guess it never happened). I also tried to make it happen in the PDF software but couldn't find a way to apply regular expressions in a replacement fashion. I'm sure I could find a way, but it would be tricky to do it without getting the labels to left-align again, and after having spent hours and hours manually inspected every single label on all three editions I didn't want to go through that tedious work again. Good point about the star labels. I actually tried to get rid of them at first so it was somewhat intentional. And then I decided I wanted the brightest ones back but it seems I only got half-way. I'll write it down for a future upgrade. Regarding the constellation lines I took what Carte du Ciel offered. Not knowing much about what lines are "official" I can say I didn't really like the design that CdC offered. I saw now that someone uploaded a new file to the CdC mailing list with constellation lines used by some "astronomy magazine", but by then I had started liking them.